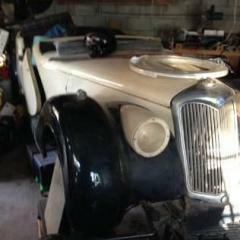 I can help you find antique cars, parts, and your dream car. I locate and place, and pair cars, parts both classics, antiques any and all types of cars I will help you find your match. I can also help arrange the logistics of delivery pickup etc. Fell free to contact me on here or text me at 5183284222. Thank you! Up for offer is my 1941 Buick super convertible ... This 1998 AACA grand national champion is not only stunning , it performs as well . Fully restored by Ralph Baldwin , Its arrow straight with flawless paint. The interior, top, steering wheel ,chrome was all handled by Jenkins restoration. 22 years later, it still could win every award again! Fully detailed under carriage shows as well the exterior.. All receipts are available and were in excess of 70k Asking $77,500.00 ..;' I researched the market ,compared mine to the car currently on E-Bay priced higher . Look at his then look at mine , There is a difference especially in the engine compartment and under carriage. Please accept my apologies for the photos (raining very hard here) The upholstery is perfect ,so please disregard the towel on the front seat.. Located In Roxbury Connecticut, Better photos soon... Contact me via this web site or at: connauto@sbcglobal.net Best Regards to all, Frank. I have a 1939 Chrysler “cruise and climb” Overdrive transmission. It came out of a ‘39 New Yorker and I was keeping it as a spare for my ‘39 Imperial but it’s been almost 10 years and I haven’t needed it yet...”Kiss of Death, I know”... Anyway, I’m not sure if this transmission will fit all ‘39 Chrysler products or just the Straight Eight cars...nor do I know if the Overdrive unit is interchangeable with other Chrysler products from that era. It is the Overdrive that is the real jewel here as it makes these cars so much more drivable as both the eights and the sixes can cruise down the road at highway speeds without issue. My Imperial has the standard 4.30:1 rear end ratio (the non O/D cars had 3.90:1 gears) and even with these 4.30’s (short leg gears) I can still drive her all day at 75 MPH with ease. I’ve actually thought about swapping out the 4.30’s for the 3.90’s to make it even more highway friendly but would hate to lose the low end. If anyone has more knowledge of the interchangeability of these transmissions or even the actual Overdrive unit, or is interested in the complete transmission please let me know. Thanks.